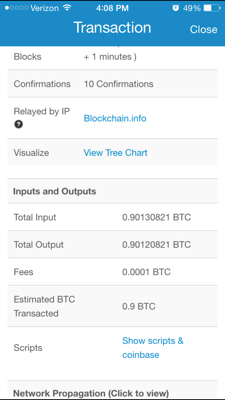 1) Why is the transaction amount more than the specific .9 BTC I wanted to send? 2) How was that amount (.00130821 BTC) chosen? 3) Where did the .00120821 BTC get sent? Unspent transaction output (UTXO) can only be spent in full, so if they don't match the amount you are trying to send exactly the rest will be sent back to yourself. Therefore I assume that you had a single UTXO of the size 0.90130821 BTC in your wallet. When it was spent, the remainder was sent to a change address in your own wallet. Not the answer you're looking for? Browse other questions tagged blockchain.info coinbase.com or ask your own question. Is it safe to authorize Coinbase to withdraw cash directly from my bank account?